This Winter was a tough one in New England. The ice storms brought down a LOT of branches. Now that Spring is finally here, it is time to deal with the mess, prune and trim things before they start to bloom, and clean up what has fallen to the ground. A hand saw will get the job done, but a chainsaw will make short work of the task. Chainsaws are excellent tools in the hands of a properly trained user. However, the handling and use of a chainsaw can be intimidating for many. 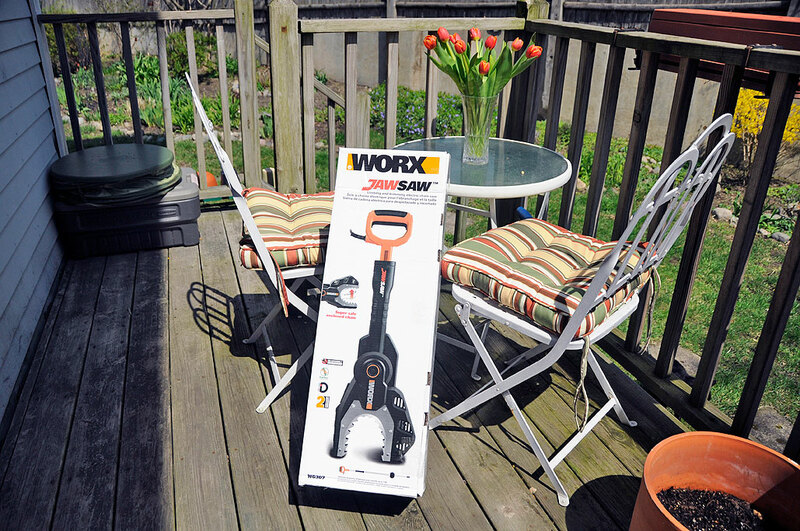 WORX recognized this and created the safer JawSaw specifically for us weekend gardeners. The JawSaw takes the basic design of a light-duty chainsaw and made it safer for the occasional user. The cutting action is still the same as that of a normal chainsaw, but the angle in which the chain makes contact with the limb will always be optimal. Also, instead of an exposed and openly rotating cutting chain, the chain and bar are wrapped in a U-shaped “jaw.” The “jaw” acts both as a cutting and an anti-kickback guard. It also functions as a depth guide (more on this later). 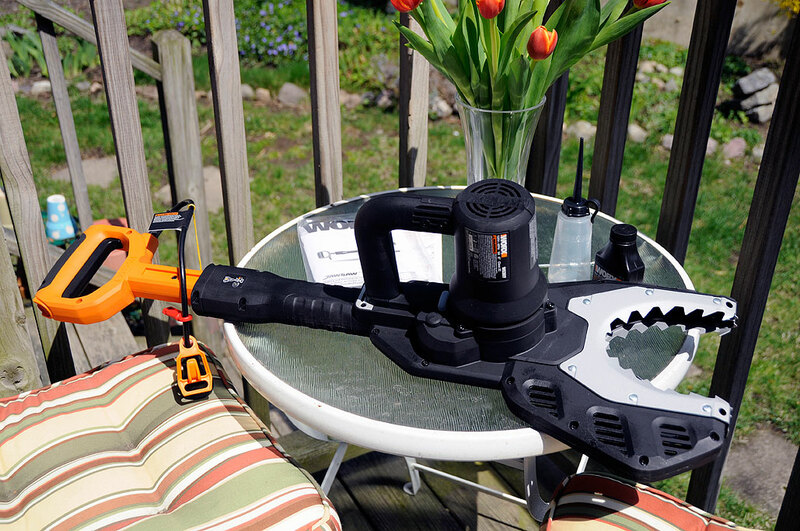 Unlike most chainsaws, the WORX JawSaw is powered by electricity (5 A/110V). We don’t know how loud it is yet, but we do know that it won’t be producing any noxious fumes. The JawSaw is a light-duty cutter with an opening which will enable it to handle branches up to 4″ in diameter. Realistically, anything thicker probably should be left to the professionals, especially if it is not already on the ground. Another difference from gas-powered chain saws, the electric JawSaw will not require the mixing of oil and gas and will be easier to startup. To reduce maintenance, WORX has designed in an automatic oiler to provide constant lubrication to both the bar and chain. The kit comes complete with a fully assembled JawSaw, tension-adjustment wrench, a bottle of chain oil, and an oiler. Because of the guard, the JawSaw can be used to make cuts directly on the ground, without fear of kickback or damage to the chain. There is no need to prop up the wood to make the cuts. The JawSaw design allows the user to just set it on the wood, push down to extend the bar, and make the cut. This is feature found in no other chainsaw. To make the JawSaw simple to maintain, WORX created an Auto-Tension system. This is designed to be an easy-to-use chain replacement and tensioning mechanism. unlike most standard chainsaws which require two separate tools to replace and set the proper tension for the chain, the JawSaw uses one bolt on body that does it all. This patented chain tensioning system prevents over-tightening by automatically determining the proper amount when tightening. An extension pole attachment accessory is available to extend the JawSaw’s reach up to 12 ft., making it suitable for pruning and cutting limbs from the ground. The extension pole requires no tools to attach and can be removed in seconds. We don’t have one in house at present, but will see if we can get one in time for the FirstUse review.